A 31-year old Scottish Lass with a love for highlight, heels and homeware. 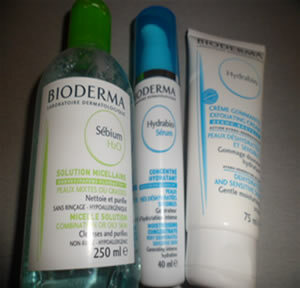 I was sent across some Bioderma products to try out including the Hydrabio Serum, the Exfoliating Cream for dehydrated and sensitive skin and the sebium h20 cleanser. Well let's just start with the Sebium h20 cleanser. This is my most favourite product of 2013 so far. Genuinely. You apply this onto a cotton pad and use it all over your face, you do not need to rinse this off. As the 'h20' implies, this is water based and feels just like having some cool water splashed on my face whenever i use it. A small amount goes a long way with this which means it will last aaaages! I've only had this for 4/5 days but ive used it twice a day everyday since getting it! i always cleanse my skin, but even after cleansing my skin i decided to use this as to freshen up and the cotton pad was FILTHY! it gets every little bit of dirt and yuckyness off your skin! Onto the Exfoliating Cream for dehydrated and sensitive skin. This is really... BEADY! It has loads of those little exfoliating beads that just rub into your skin and take away all that horrible dead skin you dont need anymore. I know this isnt supposed to be designed for correcting redness, but ive found ive got much less redness on my skin since ive started using it! you only need to use this once or twice a week and it really has helped my skin a lot. The Hydrabio Serum is a rich serum that doesn't feel oily or serum like on your skin. It applies as a serum and you only need a small amount but this almost 'mattifies' after application, and you all know how much i hate feeling like ive got product on my skin so that was great! I get really dry cheeks, head and upper lip so this was great for adding moisture to those areas. Overall, the Bioderma range is AMAZING, i'd definitely give it 5 stars. If Bioderma was a celebrity, it would be Justin Timberlake, if it was a chocolate, it would be galaxy - Yum on all accounts! A 32-year old Scottish Lass with a love for highlight, heels and homeware. Hair Straighteners: GHD V H2D: The Test! Competition: WIN Mac "Bronze" Eyeshadow! Hollys Beauty Box. Powered by Blogger. © Holly Sturgeon • Theme by Maira G.